Can I integrate my form with Prestashop database? My website is run on Prestashop, and I'm just wondering if I can integrate my form responses with Prestashop? To be a bit more specific, I'd like Prestashop to automatically generate a coupon code as an incentive for my customers to complete a questionaire using JotForm. Please let me know if this is possible. Thanks! 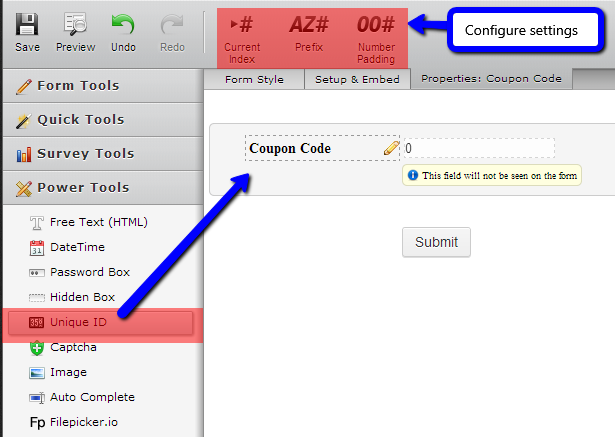 Also, since you've mentioned generate coupon code, is using Unique ID tool under Power Tools wouldn't help? As the tool name says, it will generate Unique ID every form submissions.